Laura Volkman calls herself a New World winegrower with an old world philosophy. “we let the fruit make the wine.” Hard work in the vineyard is aimed at farming balanced vines that produce wines true to the varietal and the vintage. The wines are handcrafted using gravity flow techniques at August Cellars (a cooperative facility in which several winemakers lease space) in Newberg. The Volkman Vineyard is located a ¼ mile up the hill from the winery. Laura’s long time dream of owning a vineyard came true when she and her husband Jim purchased a small farm in Yamhill County. Together they cleared the land and planted vines. Laura learned the art of winemaking through constant inquiry, training at the Northwest Viticulture Center in Salem, Oregon, and interning for two years with Mike Etzel, the long-time winemaker at Beaux Freres. Her first release was in 2004 and already her wines have garnered attention among wine enthusiasts and the press. 13.8% alc., $25. · Clear bright yellow in color. Yeasty aromatics followed by poised citrus, herb and oak flavors nicely composed. Brisk acidity leads to a clean and refreshing finish. I like this a lot. Now that proper clones of Chardonnay are planted in Oregon and winemakers used to crafting Pinot Noir have got the hang of it, there are many impressive examples of Chardonnay now being offered throughout the state. 14.4% alc., $30. She says this “cute little cuvee was made for my husband but it’s too good to drink all by himself.” Several Dijon clones with a small amount of Pommard blended in. · On the nose there are dark red fruits, a little good funk, and a hint of oak. Brisk and lively in the mouth with spiced cherries and berries and a complimentary citrus note. Very clean mouth feel. Perfectly fine. Laura Volkman Vineyards address is 13000 N.E. Quarry Road (off 99W), Newberg (August West Cellars). Tasting by appointment. 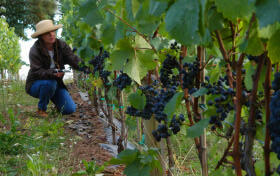 The wines are sold through a mailing list or by contacting Laura at 503-806-4047. Discount for case purchases. The website is www.volkmanvineyards.com.